Mickey Mousecapade (ミッキーマウス 不思議の国の大冒険 (Mickey Mouse: Fushigi no kuni no Daibouken, lit. Mickey Mouse: Adventures in Wonderland, ミッキーマウス 不思議の国の大冒険?) in Japan) is an NES game where Mickey Mouse travels through the Fun House, the Ocean, the Forest, the Pirate Ship, and the Castle in an effort to save a young girl who happens to be Alice from Alice in Wonderland. Minnie Mouse follows Mickey around, and occasionally gets kidnapped. Various villains from Disney cartoons make an appearance as bosses. It was developed and published by Hudson Soft in Japan and published by Capcom in the United States. The game was Capcom's first venture into what became a successful trademark of making Nintendo games based on popular Disney characters. This is the only Capcom/Disney title that was not developed by Capcom and the game contains several sprites lifted from other Hudson Soft games. This game is sometimes incorrectly identified as Mickey Mousecapades. 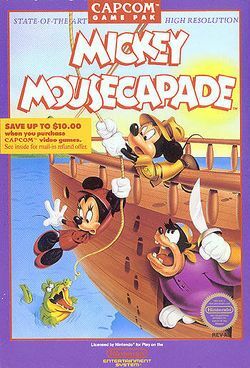 The title screen of the US version refers to the game by its Japanese title, which is simply Mickey Mouse. A Hidden Mickey can be found embedded in the circuit board when the game cartridge is opened. Mickey and Minnie are trying to rescue a "mystery friend", who turns out to be Alice from Alice in Wonderland. In the Japanese version, Alice is prominently featured on the box art. This page was last edited on 9 December 2015, at 07:33. This page has been accessed 12,714 times.